K-Line Excavating has been in business since 1989. For more than 20 years, we have provided reliable earth moving services for residential, commercial and industrial customers. Our goal is to perform efficient and accurate excavation for our clients to keep jobs within budget and on schedule. We own and operate a variety of earth moving pieces from the small skid-steer to hydraulic excavators. Due to the expanse of our equipment, we are able to perform any size job. K-Line also transports its equipment directly to the job site. By moving our own machines, we can guarantee that the equipment arrives on time at the right job site. 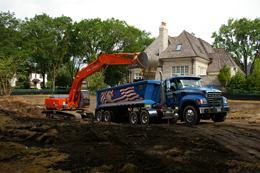 From beginning to end, K-Line Excavating oversees the entire project and insures complete customer satisfaction.